Christie Chapman is a single working mother who spends her days commuting to her secretarial job in London and looking after her teenage son, Finn. It can be tough just getting through the day but Christie has always found comfort in her love of crafting and any spare time she has is spent in her parents' summerhouse working on her beautiful creations. From intricately designed birthday cards to personalised gifts, Christie's flair for the handmade knows no bounds and it's not long before opportunity comes knocking. All of a sudden Christie sees a different future for her and Finn - one full of hope and possibility, and if the handsome Max Alexander is to be believed, one full of love too. It's all there for the taking. And then, all of sudden, Christie's world is turned upside down. I feel like ive been stuck in a reading slump forever (in reality its been about 4 days) but whatever book i picked off my bookcase wasnt working for me, i tried picking at random - reading synopsis - getting the OH to pick but nothing. Then i found this hidden behind a few books, i had got it from a chairty shop before we moved and i was so happy because i had been desperate to buy it anyway. Having made cards here and there, selling a few at work and dreaming of ever making it big - so when a small competition in her crafting magazine catches her eye, Christie and her mum crack on with the entry, filling up on alcohol - in the more sober light, that idea gets scrapped. When opportunity unexpectedly comes knocking, and a turn of life - this could be Christies chance to turn things round, but just like that, as things are looking up, they are suddenly not again with some drastic life changing news. My heart went out for Christie having to deal with a range of massive blows, and still having to tackle life daily. Things certainly did brighten up with Max Alexander popping into the equation and her morning companion bringing her breakfast on the coach. Paper Hearts & Summer Kisses was the perfect read to fix my slump, it was heart warming, laugh out loud but also full of drama. I don't know how woman could take on so much and still be such a wonderful person with everyone elses interest at heart and never her own. This really was such a wonderful read that i would recommend to everyone and anyone. It was light enough that i could enjoy it at a steady pace (although i crammed it into every spare minute i had) but so much drama that it wasnt just a list of one womans craft activities. I think Carole has done a wonderful job of fixing my reading slump (as i kindly tweeted her) and is fast becoming one of my favourite authors. 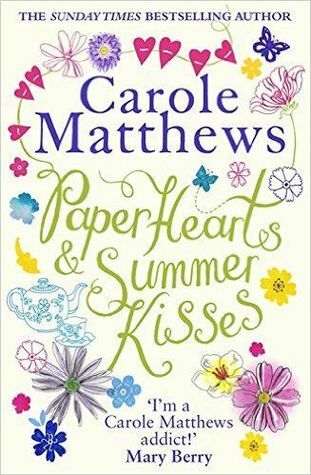 Carole Matthews is an international bestselling author of hugely successful romantic comedy novels. Her unique sense of humour has won her legions of fans and critical acclaim all over the world. A Minor Indiscretion and A Compromising Position both reached the Top 5 in the Sunday Times bestseller chart in the UK. You Drive Me Crazy reached number 8 in the original fiction charts. The novel Welcome To The Real World was shortlisted for RNA romantic novel of the year 2007. In 2006 Carole co-edited - with writer Sarah Mlynowski - two new editions of the hugely popular Girls' Night In charity series called Girls' Night Out - one for the USA and one for Canada. All proceeds go to War Child. Carole has presented on television and is a regular radio guest. When she’s not writing novels, television or film scripts she manages to find time to trek in the Himalayas, rollerblade in Central Park, take tea in China and snooze in her garden shed in Milton Keynes which is near London, England. I'm new follower of your blog, can you follow mine? This sounds like a great light book! Sounds really uplifting, will have to look into it! Thanks for sharing!